It's that time of year here in Florida when I have the fortunate opportunity to observe 3 of my favorite species of raptors during their active nesting period. If you've ever caught an episode of House Hunters on HGTV, you'll see that most people have a "top" list of things they desire in a future residence. Location always seems to be one of those! As I watch these different species each year, it's fascinating to learn about what tops the list when choosing a nesting sight. Some of location choices make perfect sense, while a few others are a little more perplexing! Its also interesting to look at the similarities and differences that exist between the species, as well as within them when it comes nesting locations and behaviors. 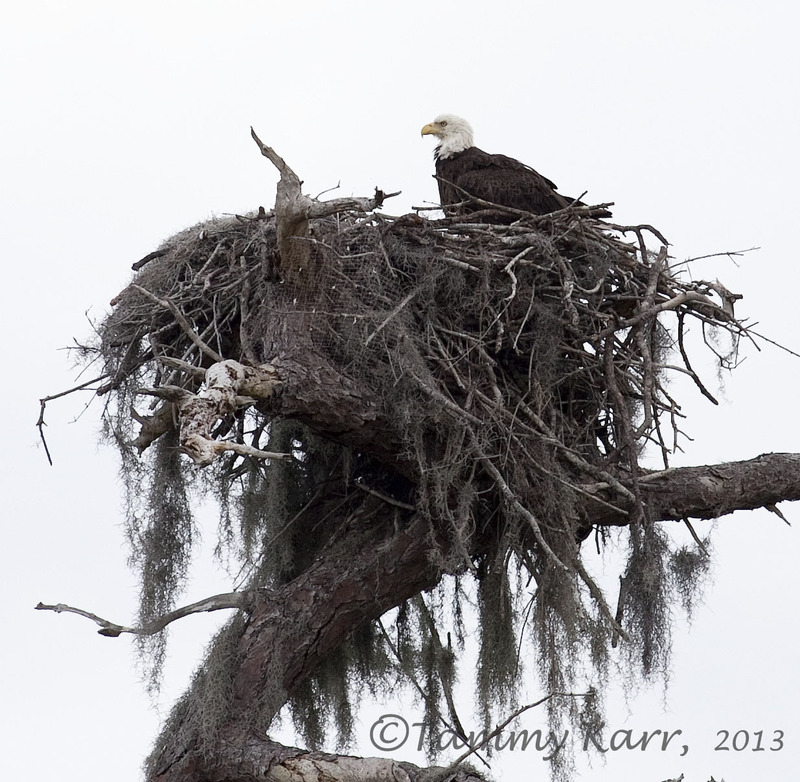 It's almost impossible not be impressed each and every time I see a Bald Eagle's nest. 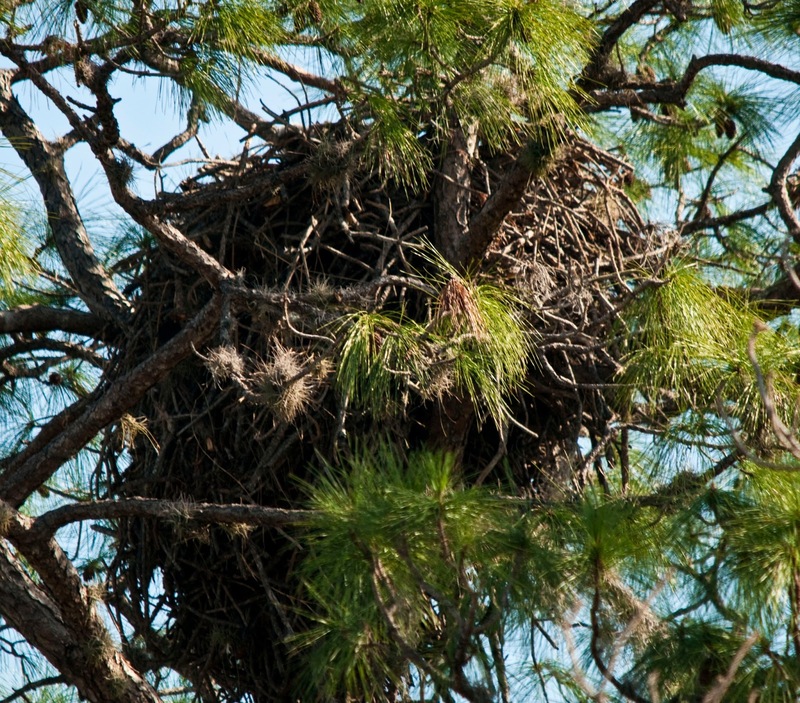 Most Bald Eagle nests are built in the protective branches of a one of the tallest living Pine Trees in their habitat area. 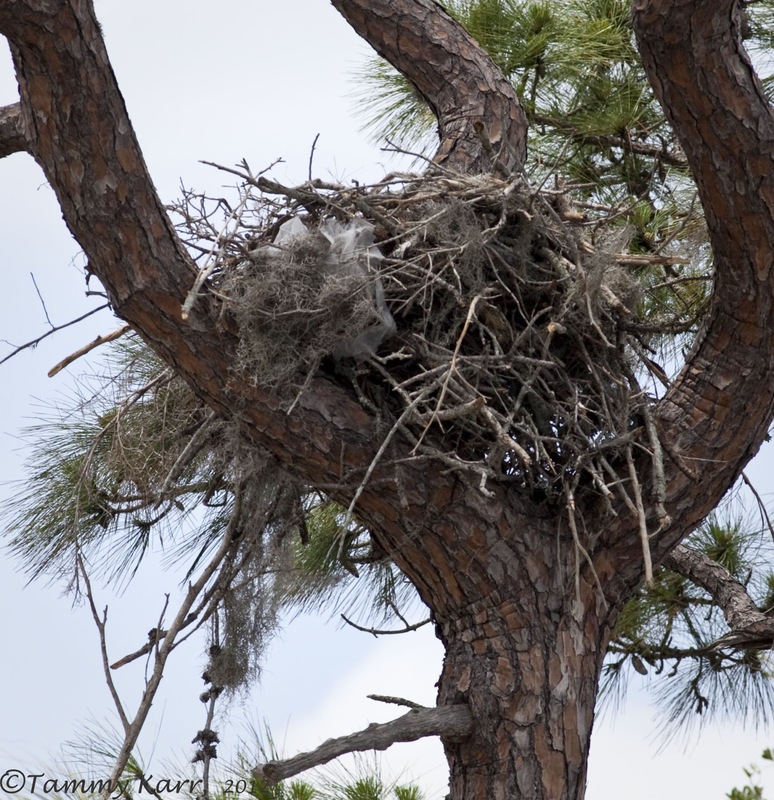 Most Eagle nests also have a body of water close by so the Eagles have easy access to sources of food. Bald Eagles tend to choose a quiet location, away from human activity and disturbance as they are known to be particularly sensitive to disruption during their nesting season. There are three local Bald Eagle nests that located off the beaten path that I observe from time to time such as the one above. 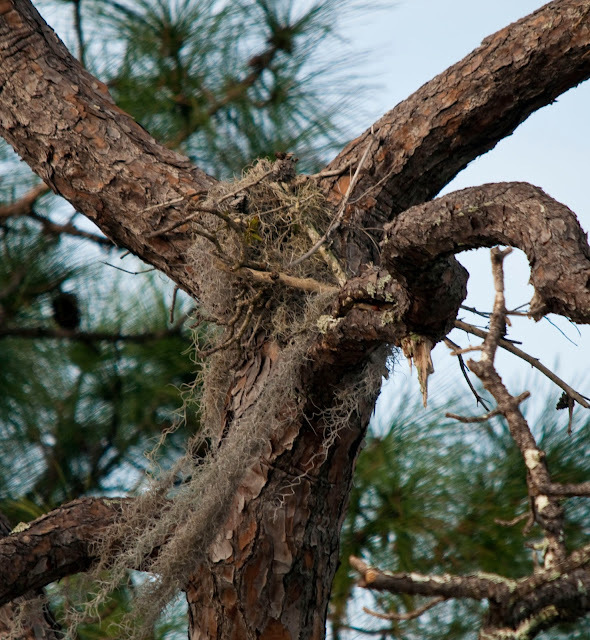 A few weeks ago, I came across this Eagle's nest build on the exposed top branches of a Pine standing in a cattle pasture near a well traveled road. The Eagle's mate was standing watch just on the other side of the road. This pair has a great aerial view of their surrounding area. I spend the greatest amount of time observing nesting Ospreys. These birds have many nesting traits and techniques similar to Eagles. 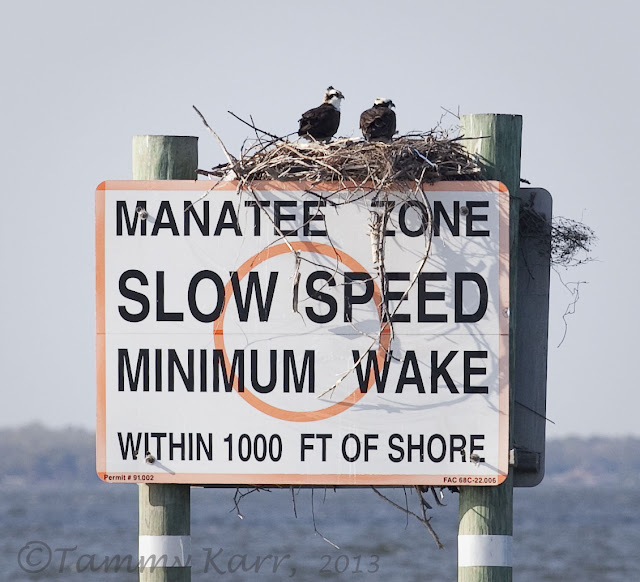 Thanks to close proximity of the Indian River lagoon, there are several dozen active nests near my home and work. Access to fresh food is definitely at the top of the "desired" list for Ospreys. 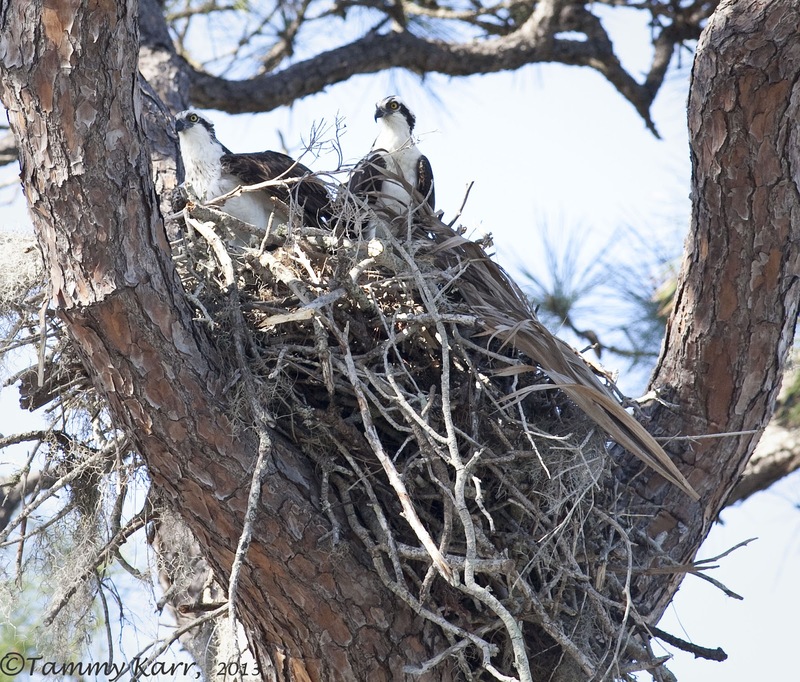 Since Ospreys' diets solely consist of fish, all Osprey nests can be found near a body of water. Like Bald Eagles, Ospreys mate for life and generally reuse the same nest each year. 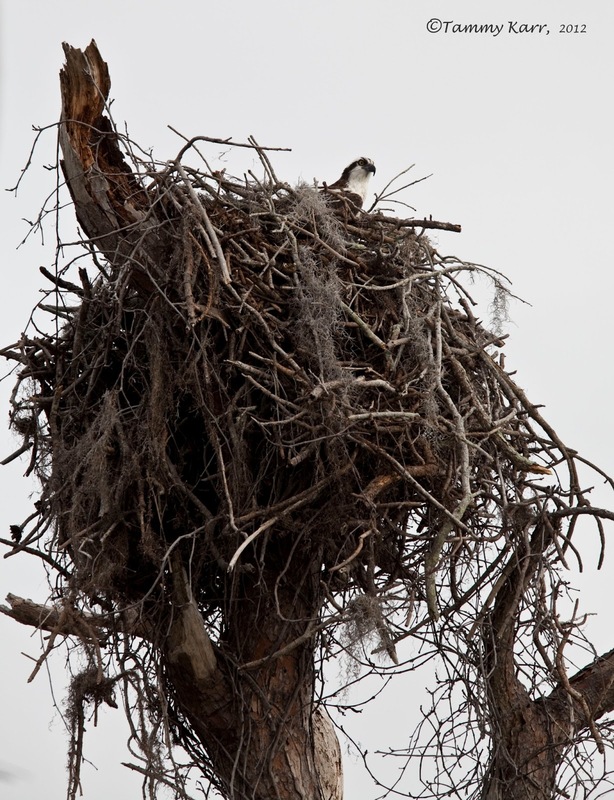 I've read Osprey's nests are considered "daintier" than Eagles, but I've seen some pretty hefty Osprey nests. 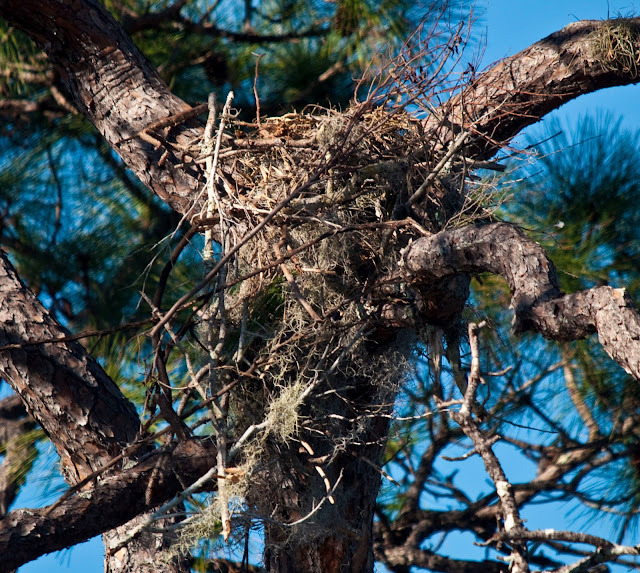 Both species add new sticks and branches to their nests each year, increasing the size and weight. Because these nests can weigh several hundred pounds to nearly a ton, both species' nests have the potential of damaging the supporting tree, especially if it is a dead tree. The above nest had been a familiar sight on my street for nearly 10 years. A few months ago however, the supporting tree gave way. Just this week, I saw an Osprey standing upon the remaining branch. I can only wonder was it was thinking. 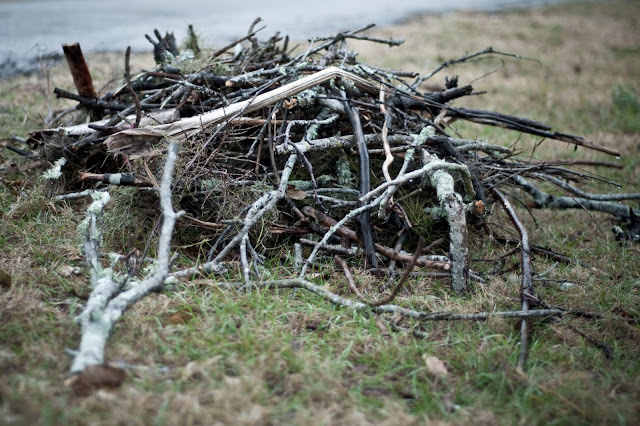 This was their collection after just 5 days of gathering moss, sticks, and branches (in January, 2010). Nearly every third piece of material they brought fell to the ground. This was there collection after just 2 weeks. This was their hard work a few days later. 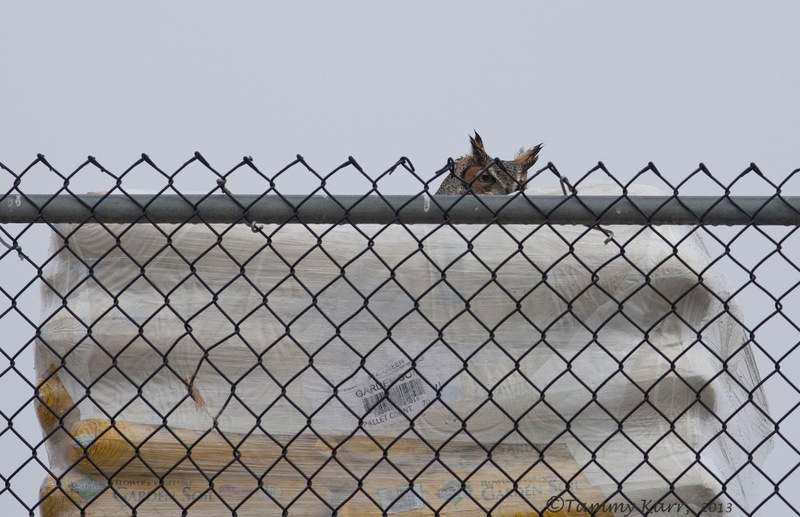 I've read that Eagles will abandon a new site if the first few sticks don't stay in place. That definitely has not been the case for this pair of Ospreys. They quickly restarted building, but it didn't amount to anything that year. 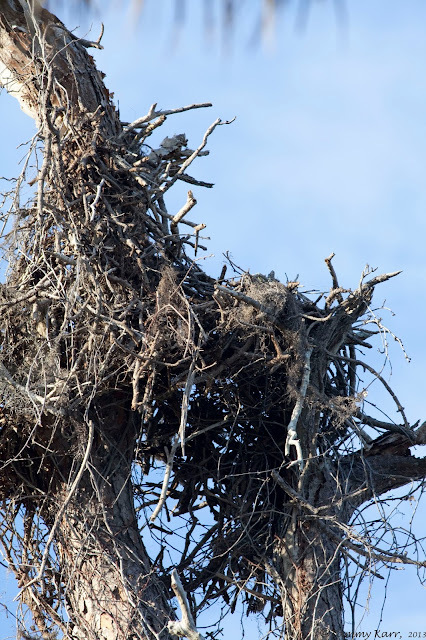 In 2011, I observed a small pile of new sticks, but it didn't seem like the Ospreys made a strong attempt to build. In 2012, it was time to get serious! The Ospreys showed up with some new floor plans and got to work. The above nest was what they constructed in a little over a month. I observed the Ospreys in the nest together for a period of time, but no chicks. Hello 2013! 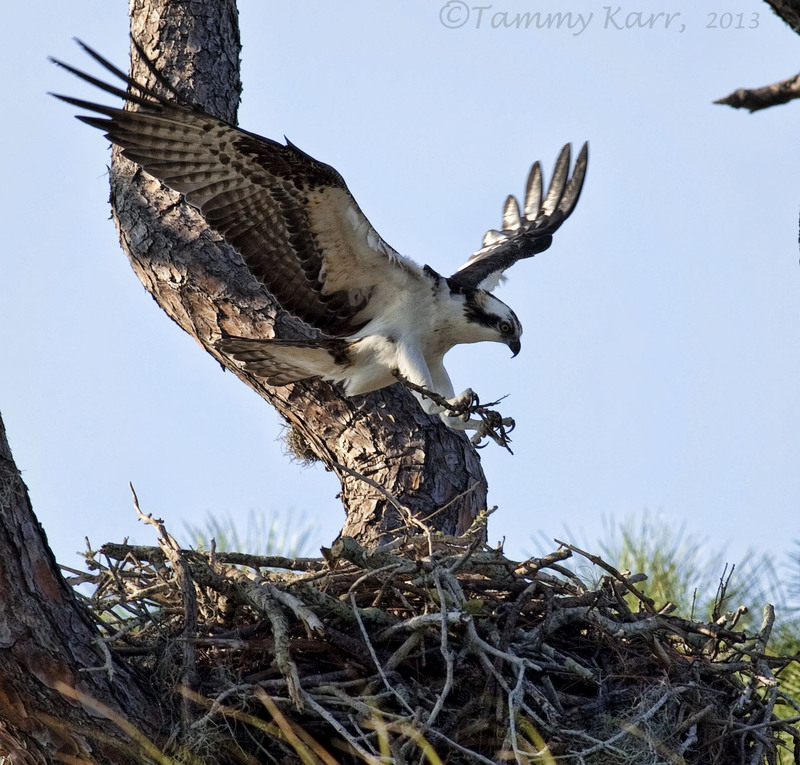 The Ospreys are back in their nest this year. They've spruced things up and I'm hoping they have some chicks this year. Just this week they added a wonderful finishing touch to their nest, a large piece of plastic (in case it rains, I guess). Not all Osprey choose a natural setting for a nest. This species differs from Bald Eagles in that it tends to "branch" out from nesting in just trees. 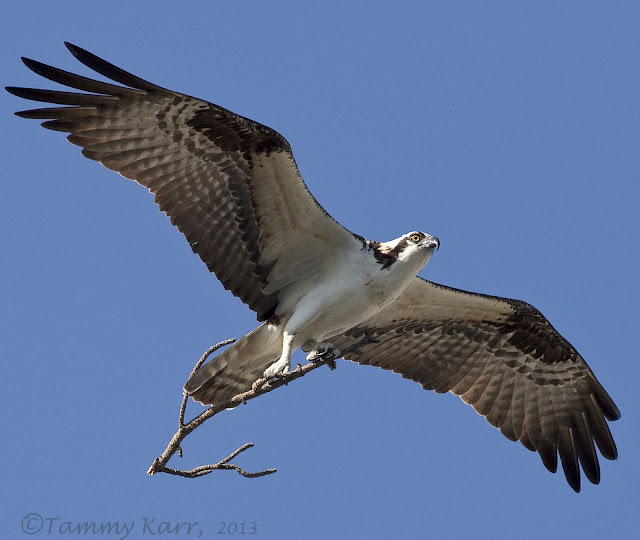 The Ospreys in this area can be found comfortably family building on a variety of structures. Artificial nesting platforms are readily available here. The vacancy rates tend to be good and there is generally no cost to the Ospreys. Some choose channel markers and other signs posted in the river for a true water front experience. Now on to the more perplexing species of the trio. 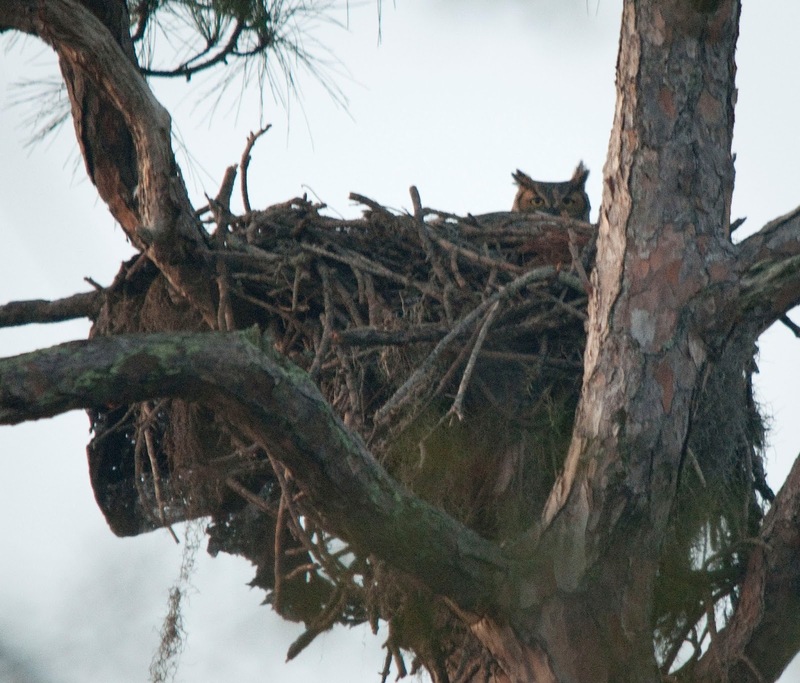 It's well know that Great Horned Owls usually do not build their own nests. Instead, they will "borrow" the nest of another species. In this area, it is common to see a few Osprey nests each year with some ear tufts protruding from the brim; a tell-tale sign that a hooter heist has taken place. Over the past few years, a few Great horned Owl pairs have drawn quite a bit of attention due to their choice of non-ordinary nest location. A few years a ago, a pair designated a planter, less than four feet off the ground, outside of the busy, local government building as their nest. 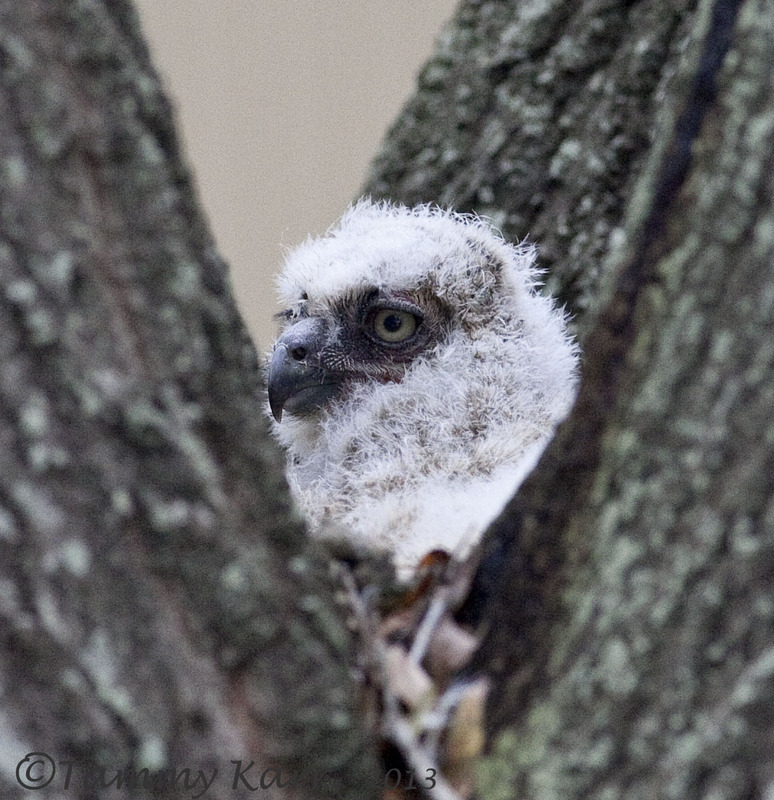 This attracted quite a crowd of spectators, but luckily their one owlet survived and successfully fledged. This year there are two Owlets being raised in an Oak Tree, about 7 feet off the ground, just steps from a very busy entrance at a local community college. Thankfully the college has roped off the area to give the growing owls some space. 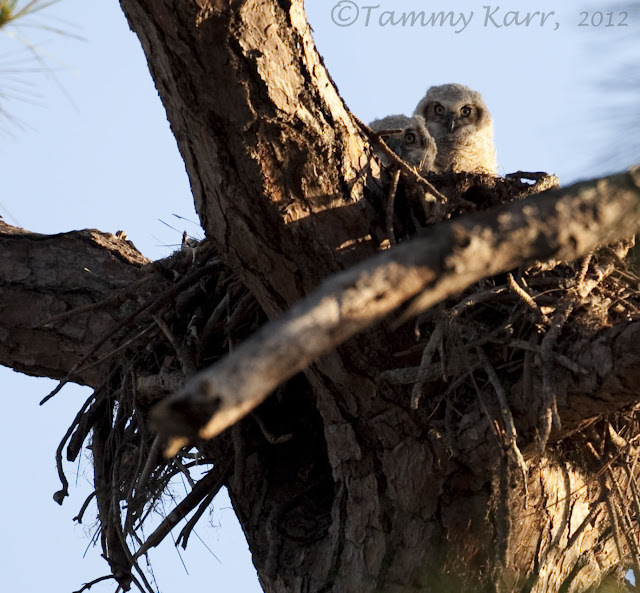 The owlets are growing fast! Last month, I was making one my regular trips to the large chain home improvement store when I happened to spot this owl on a pallet of garden soil on the top rack of the outside gardening area. I wondered if this was its "nest". For the following 3 weeks, I observed this owl in this location and assume it was nesting. I haven't seen the owl in the past few weeks, so I'm guessing it did not have success and moved along. 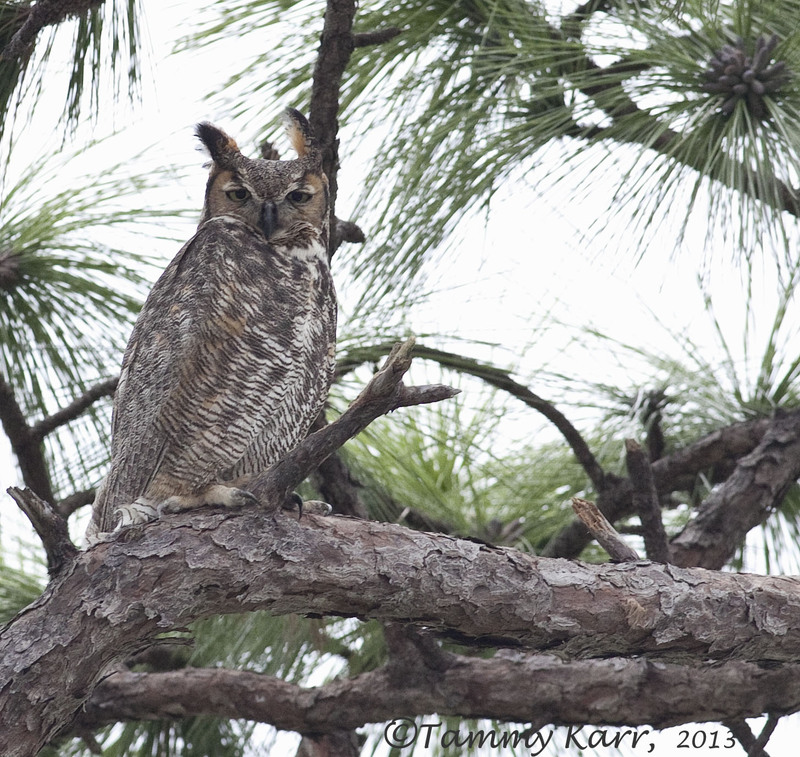 These usually elusive owls seem to choose highly public locations! Wonderful captures. I especially like the osprey carrying a branch in-flight. Magnificas capturas de los nidos de estas preciosas rapaces. What a thrill to find and capture these gorgeous Eagles, Osprey and Owls. 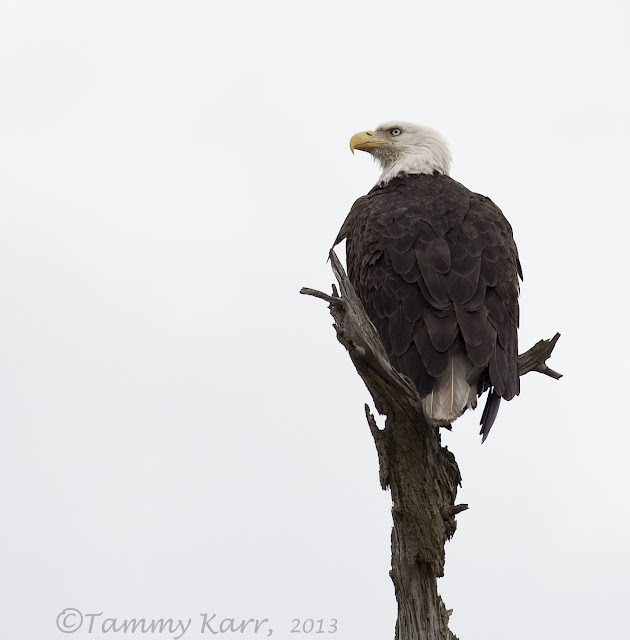 Fantastic photos and info, Tammy. Thanks for sharing! Love the Owla you are so lucky to have seen so many of them. Im still searching for them. Great story and pictutres. Tammy, I truly enjoyed reading this wonderful post! 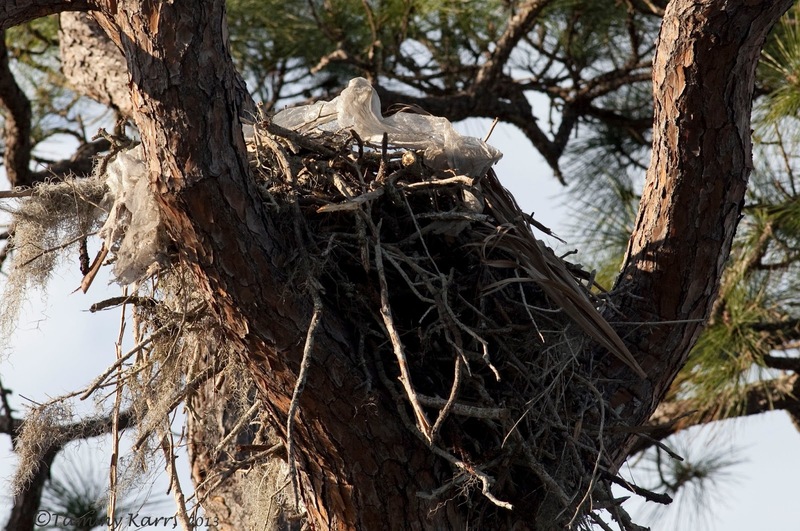 How lucky you are to observe these three species of birds in and around their chosen nests. 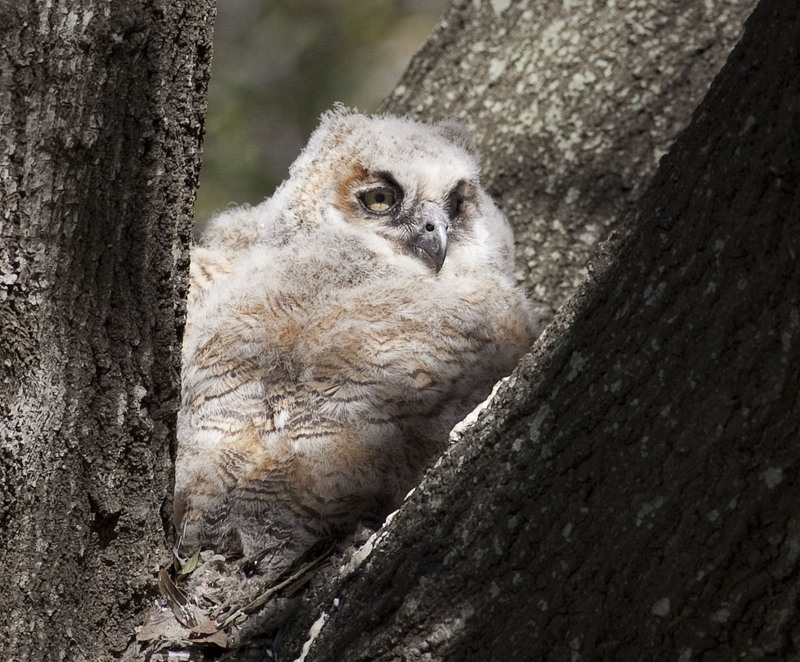 I'm always looking for owl nests in our area, but I have yet to spot any. I recently spent some time in Florida and enjoyed watching both Osprey and Eagles tend to their nests and chicks. As always, your photographs are superb. Great post!